Many Americans would be shocked to learn about the long history of anti-Catholicism in the United States. The standard narrative of U.S. history is one of religious liberty and toleration. Unfortunately, this is far from the truth. From the beginning, the majority of the U.S. population has been composed of various Protestant sects. Protestantism’s roots were anti-Catholic in origin and the Protestant Reformation kicked off years of violent conflict between the two Christian rivals. This legacy of hatred was inherited by the Protestants that settled in America. Following independence many states banned Catholics from holding public offices out of fear that “Popery and the Inquisition may be established in America.”(1) Anti-Catholic sentiment only grew as Catholic Irish and Italian immigrants flocked to the U.S. during the nineteenth century. 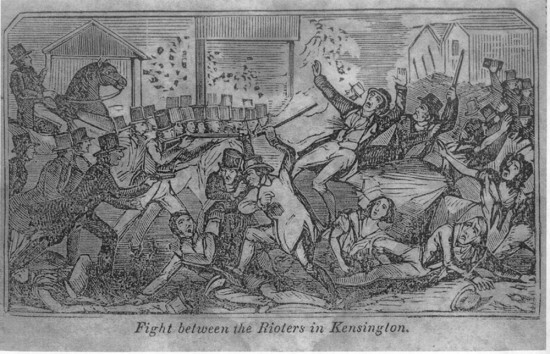 One of the more violent outbursts against Catholics came during the Kensington and Southwark Bible Riots in Philadelphia (1844). Given the importance of this topic in light of the increasing anti-Islamic attitudes, I think Farrelly’s review of our anti-Catholic past is apropos. Read her entire essay here. (1) Major Thomas Lusk at the Massachusetts Ratification Convention (February 4, 1788) in The Documentary History of the Ratification of the Constitution, vol. 6, p. 1421. ← Why are the Sephardic Jews Who Fled Intolerant Spain in the 15th Century Now Considering Returning?